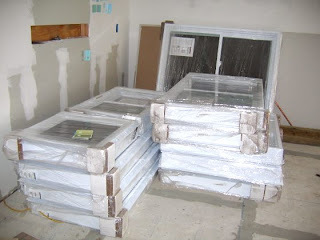 Apparently, I've Been Domesticated: The Windows Have Arrived! Funny story. I kept getting calls from some 866 number. I assumed it was a telemarketer or maybe someone calling about who I should vote for. Every time that number would pop up I'd get more an more annoyed. Who are these people? Why are they calling me!? I'm on the do not call list darnit! Finally, on Friday I was so irritated I picked up the phone all sorts of ready to yell at someone. Yeah, so I'm an idiot. It was a recording letting me know my windows were here a week and a half early. Oh well. They're here and they look really good! Survivor Reliabilt vinyl windows. They were rated top of the list with Consumer Reports as far as vinyl windows go anyway. They'll start going on this weekend.